A great book about a magic dime that transports the holder to another time. Well-written and characters are well-developed but the ending is very abrupt. Samantha is a girl in modern time. She lives in the era of the iPhone and iTunes. 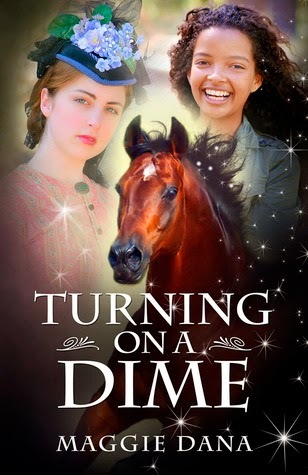 Her world is turned upside down when she finds a dime that transports her to another era. There, she meets Caroline. Caroline is a girl who lives in the South during the Civil War era. She has her own set of problems like being grounded, not being able to ride her horse, and being sent to her father’s friend’s house for 5 days. When Caroline meets Sam, they both freak out. Sam isn’t supposed to be in this era and she doesn’t know how to get back home. While the two of them figure this out, they become good friends. Sam ends up telling Caroline about the future; like how the North wins the battle and how slavery is abolished. While all of this is happening, Caroline finds out that her house has been taken by the Yankees and that her family has fled from there. Caroline wants to run away from this place to find her parents and Sam agrees to help her. Also, Sam has to pose as Caroline’s slave and she learns many things about slave treatment in the South firsthand. Will Caroline be reunited with her family? Will Sam find her way back home? I liked your poem! It is inspiring.